The photo left highlights numerous desert plants. 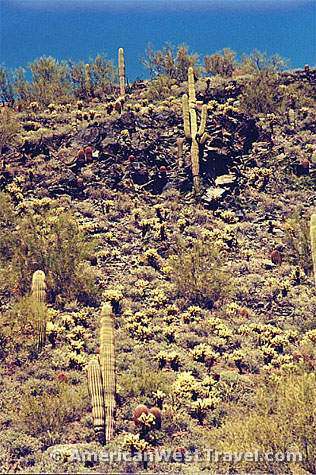 The small, shiny cactus which dominates this steep slope is the teddy-bear or "jumping" cholla. It propagates by dropping spiny links off its arms. If you brush against one while hiking a piece may "jump" into your leg! Not only is this painful, but they can be difficult to remove. There are many varieties of cholla. Buckhorn cholla also likes well-drained slopes and is very common here. The tiny "pencil" cholla is less common but found here, too. The red cacti are barrel cacti. 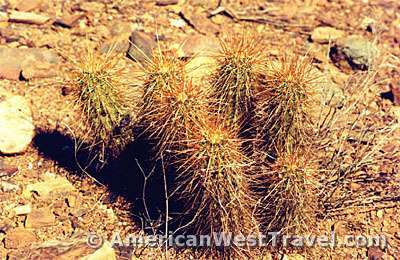 They are far less common than other cactus varieties and prefer very steep and rocky hillsides. 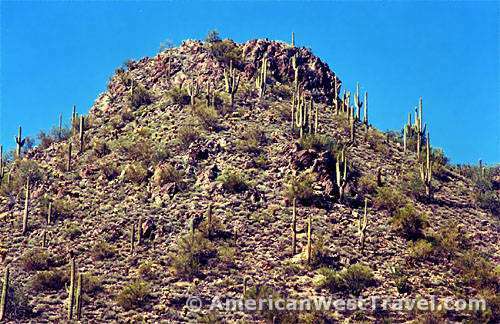 The large "shrubs" on the hillside above are actually small palo verde trees. 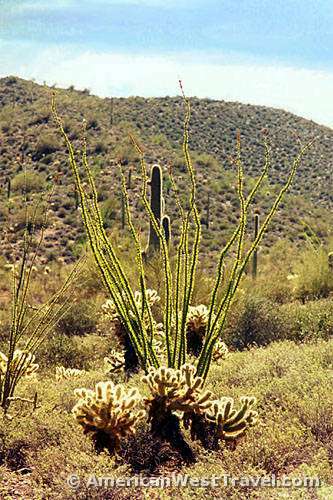 Generally, desert trees are found in well-watered canyon bottoms or wash areas. However trees do occur on the hillsides here at Cave Creek, especially the versatile palo verde (which is the state tree of Arizona). Other trees found here are varieties of mesquite, ironwood, and desert broom. Deciduous trees do not occur here. 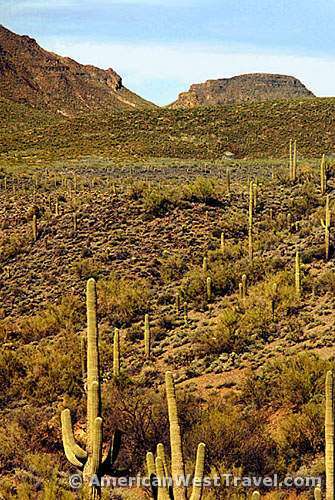 The hillside shown right features two bright green ocotillo in the foreground, more teddy-bear chollas, a large palo verde, and saguaros on the hilltop in the background. 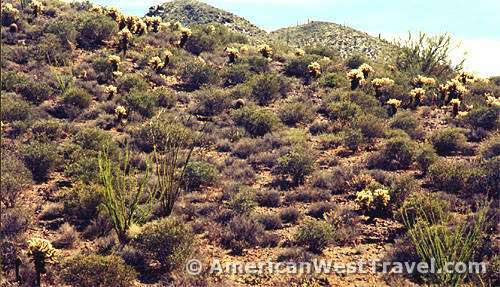 The dense ground cover which gives the foothills its lush look consists primarily of burrsage and brittlebrush. The brittlebrush puts out large yellow flowers and can make a very impressive display following a wet winter. Also common are Mormon tea and jojoba. 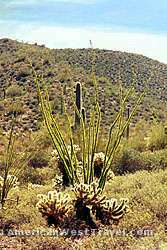 The ocotillo is not actually a cactus. Under normal dry desert conditions, it sheds its leaves and with its long thorns, the ocotillo definitely looks like a cactus. However after a period of heavy rain the ocotillo becomes covered by beautiful bright green leaves as shown left. As a bonus, it grows bright red flowers from its tips in the spring. Shown right is a cluster of prickly pear cacti. 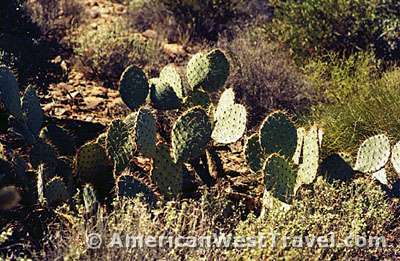 The prickly pear prefers dry hillsides but is extremely versatile. It is found on dry hillsides all over the country and is quite common at higher elevations and in transition zones (where deserts end and mountains begin). While civilization does intrude somewhat on the park's fringes (right), the park trails offer miles of fine hiking and unspoiled vistas. A modern (and inexpensive) full service campground makes the park attractive to out-of-town visitors. Metropolitan Phoenix is one of the fastest growing areas in the country. While the area has started to suffer many of the woes attributed to extreme growth, the city of Phoenix and Maricopa County have set aside substantial tracts as parks, preserves, and recreation areas. Phoenix has more square miles of parkland than any other city in the country. No matter where you live (or are staying) in the metro area, you have quick and easy access to a quality outdoor experience. Special thanks go to Natalie Trager, park naturalist, for her patience in answering my questions for this article. 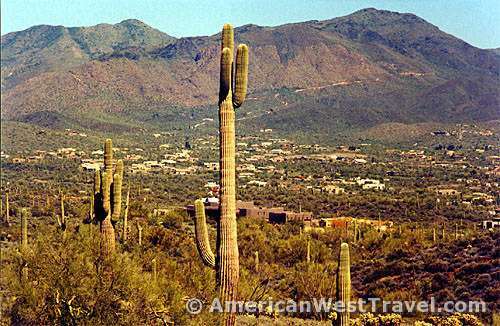 To reach Cave Creek Regional Park, go north of Phoenix via Interstate-17, then east on Carefree Highway (state-74).